After one regular legislative session and two special sessions, and scant hours from the end of the fiscal year and the shutdown in public services that would ensue without a new operating budget, we finally reached agreement today on a budget that will fund state services for the next two years. I appreciate the amount of stress this has put on the tens of thousands of families who either work in state government, depend on public services, or rely on state government for economic development, business, environmental or educational support. I’m sorry the Legislature has put you and your families through this ordeal. Many other families will not be as fortunate because this settlement will undoubtedly be the fifth straight year where the budget has needed to be cut in order to balance against projected revenues. This is one reason I voted against the budget; I could not in good conscience vote to balance the budget on the backs of Washingtonians for a fifth straight year, especially when there were numerous tax loopholes we could have closed to generate much-needed revenue. Reporting throughout these negotiations has been sketchy because progress has been sketchy. Negotiators met behind closed doors, embargoed information from those meetings, and bargaining has taken many convoluted paths with many dead-ends and much backtracking to get to the final agreement. I have my own impressions of the unprecedented process the state has just been subjected to, which I’ll send out a general update later after I’ve had a chance to reflect on the process. While the Operating Budget looks to be done, the Legislature still needs to address the Capital Budget and a transportation revenue package, as well as other bills necessary to implement the budgets. I’ll keep you apprised of the progress of those negotiations. Sine Die is the Latin phrase the Legislature uses to mean the end of session. We adjourned the 1st Special Session Sine Die last Tuesday, still without a budget, even though House Democrats agreed to the Republican demand to cut another $650 million out of their current revenue proposal by allowing the Business and Occupation tax surcharge to expire, on top of their previous proposal which had already cut $1.4 billion out of the maintenance level and education budget. There are many reasons for the budget negotiation impasse, but the major difference is ideological. Democrats believe that policy changes should not be on the table at this point, 2&frac12; weeks before a potential governmental shutdown. Our main job is to write a budget, and the state is running out of time. Republicans are insisting on policy changing legislation and say they are willing to shut down government to get it. On Tuesday, Republicans on the Senate Ways and Means Committee passed a bill that addressed the State Supreme Court’s Bracken decision, which created a loophole in our estate tax where married couples are exempt from the tax whereas single individuals must pay. This new loophole created a $160 million hole in our budget targeted for education because the Estate tax funds the Education Legacy Trust Account. Throughout most of regular and special session, both sides assumed we’d fix this loophole. Then, about two weeks ago, the Republicans decided to leverage this basic correction to create a new tax exemption for multi-millionaire estates that would drain state education revenues for decades to come. Democrats just want to close this loophole, not create a windfall for multi-millionaires. Senate Republicans forced a vote on so-called Workers Compensation reform legislation that would eliminate the Board of Industrial Insurance Appeals review of structured settlement agreements and to delete the requirement that they are in “the best interests of the injured worker.” You can hear my argument against that bill here. Senate Republicans forced a vote on a so-called education funding reform bill that would limit state spending in all other areas in order to fund the basic education budget. In other words, they want to squeeze funding for aged, blind, disabled, workforce training, mental health, higher ed, … basically everything and anything else to put toward basic education. You can hear my argument against that bill here. Senate Republicans forced a vote on new payday lending legislation that would exploit poor people and basically legalize usury. Senate Republicans forced a vote that would usurp teacher collective bargaining and eliminate due process. All these policy votes came within the last three days of the special session, at a time when all our focus should have been on passing a budget. 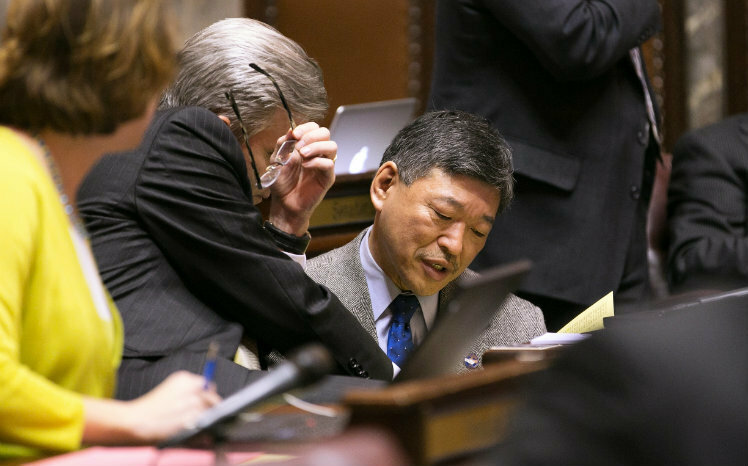 Normally, according to rules that are mutually agreed to at the beginning of each session and which have been followed for a hundred years, policy bills die at the policy cutoff, which was way back on Feb. 22nd. If policy bills fail to pass by cutoff, they are worked on and vetted during the interim, in hope of passing them in the next regular session. Holding policy bills hostage for the budget is a radical departure from past practices and jeopardizes our entire economy: if there is no budget in place when the fiscal year ends June 30th, then the state will face a shutdown. We’ve never been down this path in the history of the state, so it’s unknown what the impacts will be: 55,000 state employees possibly out of work with the loss of their paychecks felt everywhere from grocery stores to savings accounts; human services and business services suspended; infrastructure and housing construction halted; economic development coming to a standstill; basic and higher education closed. The list goes on and on, and it’s not a pretty sight. There’s still time for Republicans to let go of their policy demands and focus on passing a budget, but I’m not optimistic that that’s their goal. It appears that their regressive policies that hurt the middle class in favor of a corporate agenda take precedence over a budget, and they just might send the state over the cliff to get what they want. Gov. Jay Inslee sees this train wreck coming and has called out the Republicans on their political game playing. In a press conference on Tuesday, Gov. Inslee pointed out that Democratic legislators put partisan policy goals on the back burner in order to focus on the state’s single most urgent need, the budget — and challenged Republicans to respond in kind. If you missed it, it’s well worth viewing at this link. We’re continuing to work on achieving a mutually acceptable budget, however negotiations require good faith by both parties. Republicans either don’t know what they’re doing, or are purposefully bargaining in bad faith by continually changing demands and regressive bargaining, pushing us closer to the fiscal cliff rather than settling the budget. Budget negotiations here in Olympia make the sport of watching grass grow feel like an Olympic event. So what’s the hang-up with budget negotiations? There’s a fundamental difference between Democratic and Republican goals. Democrats want to fund education, jobs, and protect family safety net programs, recognizing that four consecutive years of all-cuts budgets have already had huge negative impacts and squeezed out whatever administrative efficiencies we can find. Further cuts would devastate families and the type of civilized communities we want for our children. Therefore, Democrats want to raise revenue in lieu of more budget cuts by eliminating unnecessary corporate tax loopholes that do nothing to create jobs or improve the economy. Republicans, however, insist on retaining the loopholes and instead want to cut vital state programs and apply those savings to fund our educational mandate. Here’s where we stand: Way back on April 5th, with only three weeks left in regular session and at least a month behind schedule, Senate Republicans finally passed their “all-cuts budget” (SB 5034), which raised no new revenue, off the Senate floor. On April 12th, the House responded by voting to revise the bill with their preferred Democratic budget, which raised about $1.15 billion in revenue by closing corporate tax loopholes. That was two months ago! Since then, the Republican majority’s reaction has been to refuse to negotiate, saying “Our work is done.” They then issued a demand that the Legislature pass 33 additional policy bills that hurt middle-class families and promote a corporate agenda of rolling back workers’ wages and benefits to boost corporate profits. Needless to say, these actions froze discussion and severely dampened any hope of striking a budget deal before the end of the special session. This past Wednesday, in an effort to avoid going over a “fiscal cliff,” the House Democratic majority proposed a revised budget that took a giant leap toward the Republican proposal, even restoring some tax loopholes and drastically cutting the amount of new revenue. Literally within minutes — before they even had time to give the House Democrats’ proposal serious consideration — members of the Senate Republican majority issued public statements summarily rejecting the House proposal out of hand. A day later, after being called out by the press for failing to negotiate in good faith, the Senate Republican majority held a press conference in which they claimed to be offering a compromise proposal but offered no detail, appeared confused about the facts, and wouldn’t answer the press’ questions. You can see for yourself in TVW’s video of the press conference. On Saturday, just four days before the end of the special session, we learned that the Republicans’ claims of compromise were once again little more than rhetoric. On a caucus-line 25-23 vote, the Republican majority rolled out and passed a Senate budget that bore only minor changes from the budget they passed back during the regular legislative session. The House now has custody of the Republican Senate passed budget (SB 5034) and the Senate has custody of the Democratic House passed budget (HB 1057). Since the Great Recession started in 2008 due to the unrestrained greed of Wall Street banks, our Legislature has written four consecutive “all-cuts budgets,” slashing nearly $12 billion that was needed just to maintain existing program levels. As we entered this legislative session, we faced another revenue shortfall of $1.1 billion plus a Supreme Court requirement to significantly increase spending on basic education (the McCleary decision). So we needed more than $2 billion in new revenue just to meet current obligations. This session also began with new leadership in the Senate. Democrats won the majority of Senate seats in the last election, 26 to 23. But after the election, the Republicans seized a one-vote, 25-24 majority control when two conservative Democrats gave the Republicans their support and were awarded the top two titled positions in the Senate. But though they were given titles and nice office space, the decision-making authority in this new caucus rests with the Republicans. Democrats remain in the majority in the House of Representatives, 56-43. I believe you sent me here to fight for middle-class American values and I intend to fulfill that obligation to the best of my ability. Compromise is always necessary, but it takes both sides working in good faith to achieve it. Ultra-conservative goals pushed by legislators who don’t care, or even prefer, that government shut down are not what you elected me to pursue. We’re talking about real lives and the health of our communities, and we need to hold those accountable who would leave behind a “scorched earth” if their intransigent demands to gut our civilized society are not met. As Senate Republicans refuse to meet the House Democrats halfway or even partway in budget negotiations, the fiscal calendar is running out. June 30th is the end of our fiscal year, and without a new budget our state will go over the same sort of fiscal cliff that has threatened to shut down the US government at the federal level. This has never happened in the state’s history, so it’s unclear at this time what the full consequences of not having a budget will be. That said, it’s not hard to guess what a state shutdown would look like: Senate Democrats have laid out a number of likely scenarios and none of them is very pretty. Staff analysts are working on this contingency; however, I remain committed to trying to take the fiscally responsible path and negotiate a budget settlement before June 30th. 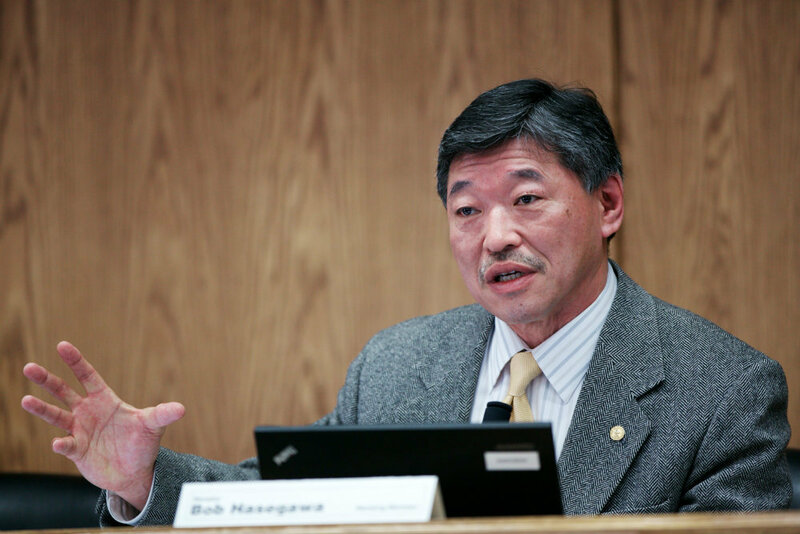 Sen. Bob Hasegawa took the Senate floor today to explain how a Republican proposal to change worker compensation would shift business costs onto the taxpaying public. 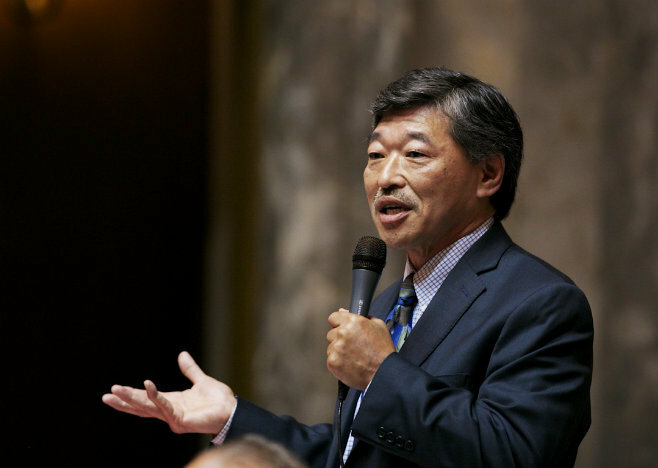 Sen. Bob Hasegawa took to the Senate floor today to make the case to fully fund education but not in a way that comes at the expense of other vital services.